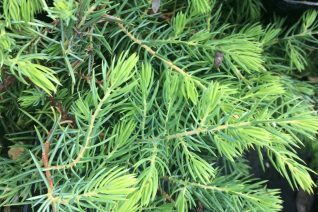 If you are going to grow a juniper then it better be good. This useful selection has new growth tipped yellow before turning to blue/green. The outside of the plant is always bright and the interior softer and darker- a happy combination. Low and spreading to 18″ high by 4′ across. 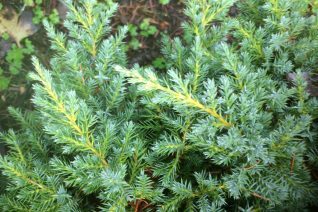 Excellent drought tolerant easy to grow evergreen for tough sites. Banks, hellstrips, places where you would rather not have the pets potty. Full sun to very light shade. Regular summer water to establish and then none is necessary. Grows faster in better soil- slower where its impoverished. Either way it will grow and thats what you want. So many junipers and so few that are really interesting. This guy caught our attention for its relatively soft growth (to the touch) that is incredibly dense and flat to the ground (prostrate). 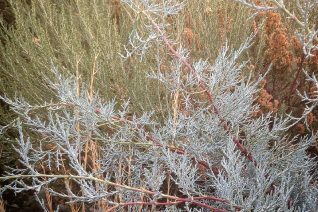 In summer the foliage is a soft blue green and in winter it changes to soft lavender buff. Very pretty. Excellent solution for tough dry sites where you need to cover the ground completely. To just inches tall a single plant will spread 3′-4′ wide. Light to little summer water in full sun to very light shade. Easy to grow, useful plant. Nice looking year round. Growth flows around any obstruction- around, up and over. Excellent flowing over rock walls. Moderate deer resistance. Alligator Juniper. So called for the rough pattern that develops on the trunk. 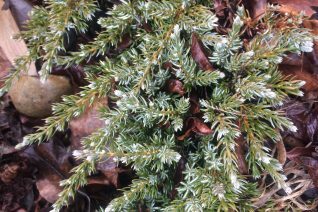 A remarkable upright growing juniper that stuns with ghostly white foliage. Finely branching open habit on an 14′ tall by 6′ wide structure. Fast growing. POOR soil that has NOT been amended is ideal. In fact it thrives in heavy clay soils if on slopes. Enriched soil causes this shrub to grow prodigiously fast leaving it vulnerable to wind toss. 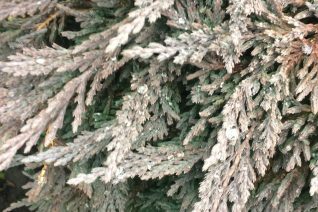 Mixes well with other shrubs, makes a great light textured nearly white focal point. Good looking year round and ultra cold hardy. Little to no summer water once established. (Just makes it grow too fast) This is one elegant but tough shrub. Moderate deer resistance. This selection has extraordinarily blue foliage for the species.